Marta Santander Martínez Bujanda loves her family’s wines. As the fifth generation of an ambitious winemaking family, she has the privilege of traveling the world, promoting the variety, quality, and sheer affordability of the wines. Her mother and uncle, Pilar and Carlos Martínez Bujanda, own the business, Familia Martinez Bujanda, one of the first families of Rioja. They have an impressive collection of wines in their portfolio, from four different terroirs in three separate regions, La Rioja, Castilla y León, and Castilla La Mancha. Incredible bang for the buck, freshness and balance, distinct varietal aromas and flavors, and tons of personality are at the core of the brand. 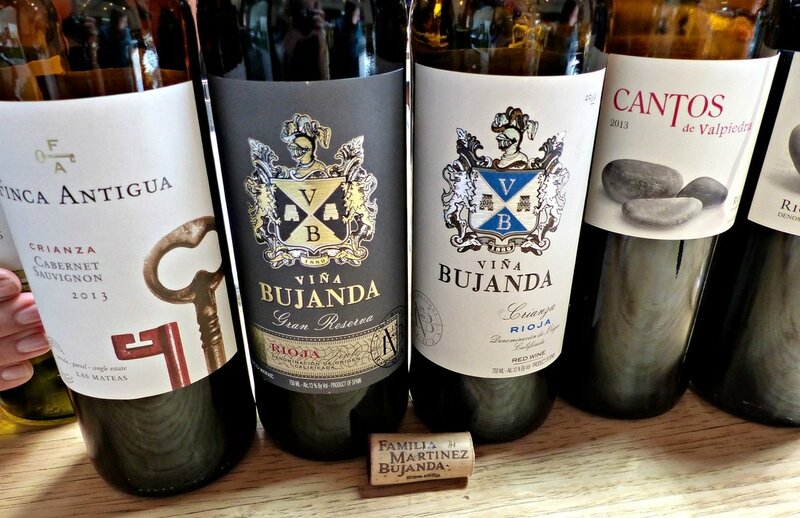 Over a century ago, in 1889, the original Bujanda winery was established in the Rioja region of northern Spain, by Joaquín, Marta’s great grandfather, who was a wine grower that aspired to make wine. In the 1950’s, Marta’s grandparents launched their grand plan, to become an export-oriented company. They combined their vineyards, and purchased new ones in Rioja Alta and Rioja Alavesa, determined to make not only wine from their own grapes, but bottle single vineyard wines, a notion certainly ahead of their time. Beyond that, to become a player on the world stage, Viña Bujanda needed room to expand and make more wine. Marta explained, “It was difficult to buy large enough vineyards in Rioja at that time, so that was one reason we decided to move to other regions of Spain.” Today they produce over 2 million bottles from the four properties, and export 70% to 65 countries, as the world embraces the quality and value that Spanish wines represent. Winemaker Lauren Rosillo is in charge of all the properties, Finca Antigua, Finca Montepedroso, Viña Bujanda, and Finca Valpiedra. He makes all the wines, guided by the wishes of the family, to honor their unique terroirs, and craft elegant wines whose quality outshines their retail price. Finca Antigua, whose name refers to the estate’s many old vines, is an experiment in extremes. La Mancha is not only Spain’s largest wine region, but also the largest in the world, where long hot summers, cold winters, a very dry climate, and intense sunshine define the wines. The vineyards of Finca Antigua make up less than half of the total 2,500 acre estate, and flourish at the 2,700 feet high elevation, where cool temperatures moderate the continental climate and keep the wines tasting fresh. Familia Martínez Bujanda bought the property in 1999, and renovated it, discovering what worked best and replanting the blocks where necessary. Divided into forty plots or single vineyards, each one is individually farmed and vinified into separate wines. 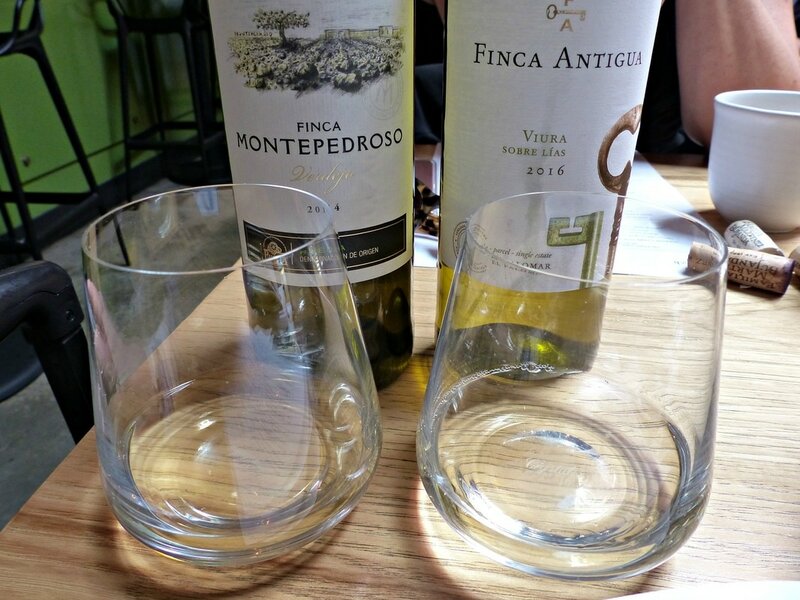 Finca Antigua grows both indigenous and international grape varietals, from Viura, Garnacha, Tempranillo, and Moscatel to Cabernet Sauvignon, Merlot, Syrah, and Petit Verdot, quite an astonishing range of wine is created here. Over one million bottles are produced in a large modern facility, and aged in a cave that keeps the humidity optimal and temperatures cool. Most of the Finca Antigua wines display an old key on the label, a reference to the old cave cellars, but make no mistake, this is modern winemaking at its best. Marta brought two single varietal wines, a Viura and a Cabernet Sauvignon. 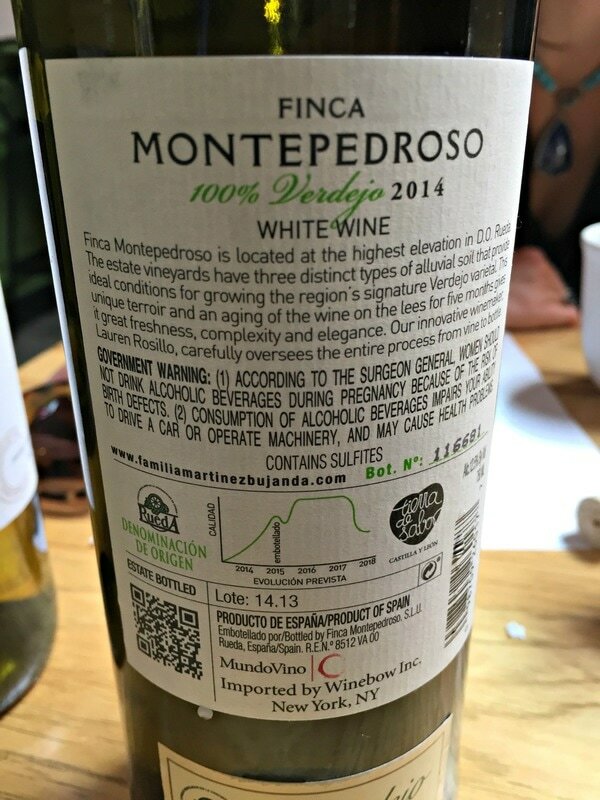 The Finca Antigua Viura 2016 comes from the El Palomar plot, and is an aromatic, full-bodied white with very good acidity, lower alcohol, and a long finish. Aromas of apricot, peach and pear, fennel and white flowers unfold on a textured palate, a result of five months of aging on the lees in stainless steel tanks, with additional time in bottle. This is a delicious, food-friendly wine, perfect for fish and seafood dishes, paella, and light pastas, and retails for $10, a lot of bang for the buck. The Finca Antigua Cabernet Sauvignon 2013 is beautiful, a balanced wine of structure, acidity, and depth of flavor, with a wild herbal flair. After four days of skin contact, along with a slow month-long fermentation in stainless steel tanks, the wine is then aged in a mixture of new and used American oak barrels for 10 months, earning it “Crianza” on the label. This is a fresh, intriguing version of Cabernet Sauvignon, and incredibly, also retails for $10, delicious to drink by the glass and a good pair with lamb, beef, and slightly aged goat and sheep’s milk cheeses. Finca Antigua only exports Viura, Garnacha, Tempranillo, and Cabernet Sauvignon wines to the US, the red wines are aged in American oak, while keeping the other varietals and blends for their domestic market, differentiated by their time in French oak. 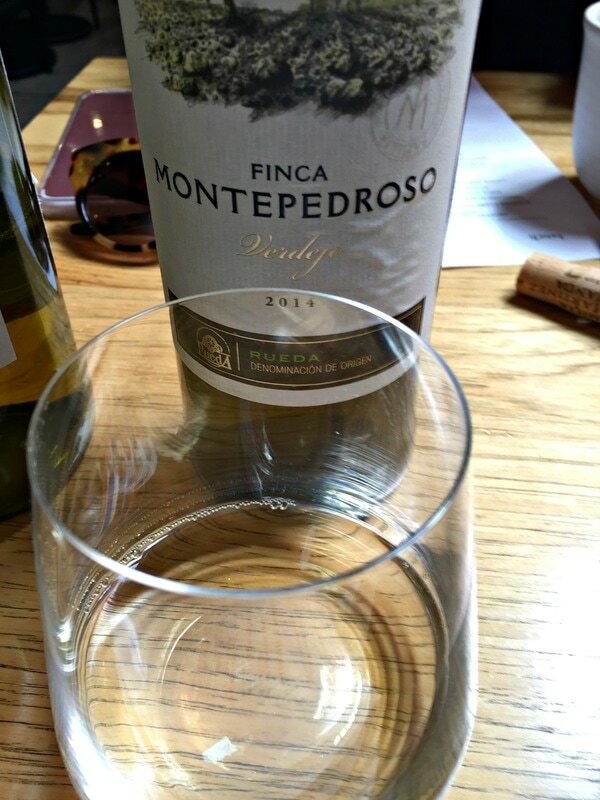 Finca Montepedroso, located in the town of Rueda in Castilla y León, is dedicated to one varietal, Verdejo. Another high elevation wine, the family bought over 60 acres in 2008, determined to make an excellent example of DO Rueda. The name Montepedroso translates to “mountain of stones”, here the gravelly soil provides the cradle for crisp and layered wines. Just like all their other properties, the family carefully farms and vinifies each plot separately at a new modern winery, located within the vineyards, which contributes to the complexity of the wine. Hand-harvested at night, fermented in stainless steel at low temperatures to preserve the freshness, and aged for five months on its lees, this Verdejo is fresh and intense, yet has a smooth mouthfeel. 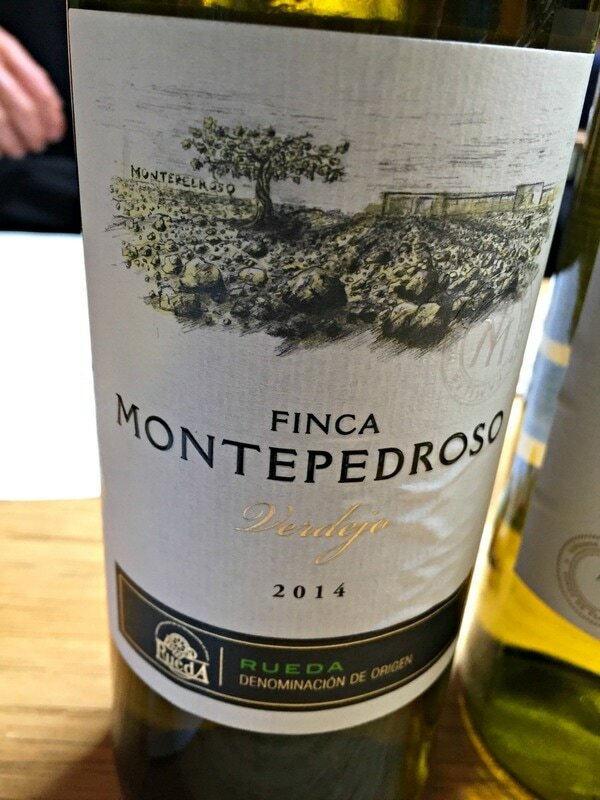 Tasting the Finca Montepedroso Verdejo 2014, an aromatic profile of apricot, peach and fennel is unleashed, with touches of fresh-cut hay and smoke. This is a leesy, mineral wine, with vibrant acidity and good structure, that finishes long and savory, with fennel and anise resonating on the palate, it sells for $16. Viña Bujanda encompasses almost 300 acres in the Rioja Alta and Alavesa regions, where 18 plots of 20-60 year old Tempranillo and Viura vines are sustainably farmed. These vineyards are located near Oyón, the village that is ground zero for the Familia Martínez Bujanda’s wine empire, where Joaquín founded the original winery over 125 years ago. Viña Bujanda produces DOCa Rioja 100% Tempranillo red wines of all classifications, from Joven to Gran Reserva, in addition to a 100% Tempranillo Rosé, Graciano, and Viura. Marta explained, “We consider ourselves to be in the middle, between traditional and modern style, Viña Bujanda is not a modern style wine, but we don’t consider ourselves strictly traditional, either.” With a total production of over 800,000 bottles, the best-selling wine is the Crianza, which accounts for almost half of their bottlings, aged for 12 months in both French and American oak. Sampling the Viña Bujanda Crianza 2014, it is fresh and balanced, a medium-bodied wine with delicious bright fruit. Aromas of blackberry and spice, along with a touch of tobacco and balsamic, make this graceful wine food-friendly, a real bargain at $15. The Viña Bujanda Gran Reserva 2010 is elegant and more complex, aged for 24 months in French and American oak, with a savory nose of dark fruit, cigar box, spice, vanilla, and oak. This is a round and rich wine, with a long, deeply satisfying finish, from Rioja’s excellent 2010 vintage. Not only delicious on its own, it is good with food, hearty dishes as well as lighter fare, and retails for $30, an amazing price for a wine of this quality. The Gran Reserva is only made in years when the fruit is at its best, and so there will be no 2013, since it was the coldest and rainiest harvest of the past hundred years. Finca Valpiedra is the jewel of the family, where over 200 acres of prime vineyard land is tucked into a bend of the Ebro River in Rioja. This special single vineyard is distinct, with its stony soils and microclimate, it’s the only Rioja winery that made it into the Grand Crus Association of Spain (Asociación Grandes Pagos de España). Fourteen plots, divided among three terraces that gently slope down to the river, are covered in large stones; this give the two wines produced, Cantos de Valpiedra and Finca Valpiedra, minerality and structure, in addition to the winery’s name, which means “Valley of the Stones”. Tempranillo, Maturana, Graciano, and Garnacha are grown, and this unique river climate has some advantages. Marta explained, “This is what we like about making single vineyard wines, the soil, the terroir, is really making a difference. This estate, for instance, we harvest two weeks earlier than in the rest of the region, or even the next plot can be two weeks later. Rioja can be unstable in September, in some vintages we have avoided that rain because of the earlier harvest.” Marta attributed this, in part, to the stones that cover the vineyard, during the day, they absorb the heat and slowly radiate it back to the clusters at night, ripening the fruit earlier, just like in the Rhône region of France. The winery, built on the top terrace twenty years ago, was meant to process the wines for Viña Bujanda, but when Pilar and Carlos recognized how special the wines were from this site, they split off this vineyard, and established the Finca Valpiedra brand. Hand-harvested, only perfect grapes make it to the fermentation tanks, and the wines are aged for 12-24 months in only new French and American oak barrels. Total production is 300,000 bottles, of which two-thirds is the Cantos. The Cantos de Valpiedra 2013, 100% Tempranillo, is smooth and seductive, well balanced in its acidity and alcohol, rich and round while retaining a fresh and mineral character. Very aromatic with dark fruit, spice, tobacco, and vanilla notes, it glides across the palate. Marta explained that since 2013 was a bad year in Rioja, all the other vineyards’ fruit that normally goes into the Gran Reserva wines were declassified and used for Cantos, making 2013 “the best Cantos we’ve ever had”. A hint of sweetness, alongside that fresh component, makes it perfect for poultry, rabbit, and pork dishes, and sells for $20. The Finca Valpiedra Reserva 2009, a blend of 92% Tempranillo, 6% Graciano, and 2% Maturana Tinta, is a riper, more intense wine, savory, smooth and powerful, with aromas and flavors of red and black fruit, leather and spice. Complex and elegant, it lingers for a long time on the palate, where hints of spice and earth emerge. This is the Familia Martínez Bujanda’s flagship wine, a pretty wine with so much going on, it retails for only $40. With so many distinct and different wines, which is Marta’s personal favorite? Valpiedra, of course, but also surprisingly the Finca Antigua wines as well. As she was growing up, there was never any pressure as a career choice, Marta reflected, “My mother never told me what to do, never pressed me to join the family business, but I always knew I was going to be in the wine business.” As the fifth generation of the Familia Martínez Bujanda, passion and dedication to quality still drives the business model. And as far as the wines, the balance is spot on, with great acidity, aromas and flavor, and a long finish. There’s a lot going on with these wines, all for a small price.